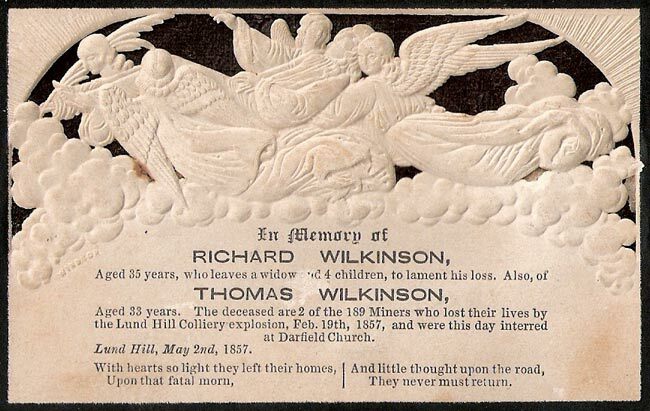 Ron Hutchinson - My Great Grandfather, Thomas Wilkinson and his brother Richard Wilkinson, were killed in the explosion. Alan Timms - My Great Grandfather, Richard Wilkinson, was killed in the explosion. My Great Great Grandmother, Sarah Ann Allen was the sister-in-law of Thomas and Richard Wilkinson. She was married to their brother William. It appears that I am related to Ron Hutchinson and Alan Timms. 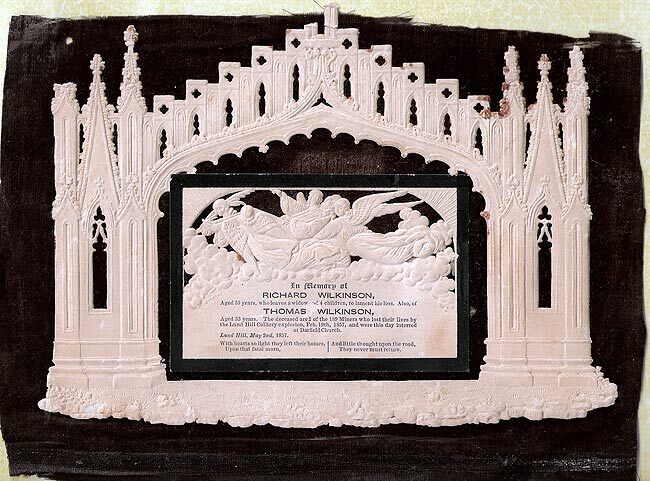 The attached is a commemorative plaque given to the family. Ron and Alan might like a copy of this if they can be contacted. I can't access their email address on your site so would you please pass this message on. The memorial is made of paper and mounted on velvet. I don't know how it has survived this long but I am very pleased to have it. I presume all surviving families were given one. I grew up in Newcastle, NSW, Australia; Coal mining is as much a part of my heritage as my ancestors. The Memorial in Wallsend, Newcastle, NSW, Australia. The Storyteller was started in 2010 by Lynn Gumb, an experienced writer and teacher in Western Australia. Participants are guided through the process of creating beautiful Family History keepsakes that will last forever. Workshops are designed to help you improve your creative writing skills, develop your proficiency in storytelling and speechwriting, research your family history, preserve the photographs, letters, documents and keepsakes of your ancestors, record your own stories for future generations and gain an understanding of the law of defamation as it relates to memoir. Mr Ron Hutchinson, I know it is a long time since he was in touch with you, but maybe he is still contactable, maybe, just maybe, we are related. My best wishes to you and your site, Thanks for the information that I have got from your site. The attached was in the local Star. Do you know anything about it. Contact with the Wombwell Heritage Group would be very useful if you have access to an address? A MEMORIAL dedicated to those who lost their lives in a tragic South Yorkshire mining disaster has been unveiled exactly 150 years later. A nearby brook was diverted to put out the fires, flooding the mine and making it impossible to recover the bodies until it was drained two months later. 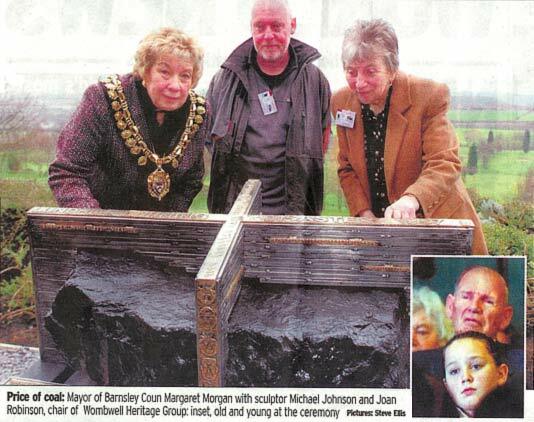 The location of the pit is now the nine-hole Wombwell golf course but there was nothing to commemorate the tragedy until Wombwell Heritage Group stepped in - in time for the 150th anniversary. The group commissioned Doncaster artist Michael Johnson to work with locals of all ages and come up with a design for the memorial which now overlooks the golf course. Mr Johnson worked with three local schools - Kings Oak Primary Learning Centre, Hemingfield Ellis Church of England Primary School and Wombwell High School - and consulted with local residents, including ex-miners, to develop a concept for the memorial. Mayor of Barnsley Councilor Margaret Morgan unveiled the memorial in front of local residents and invited guests, including a direct descendent of one of the people killed in the disaster. The aim of this project is to raise awareness and understanding of the industrial heritage of the town of Wombwell, with particular focus on a mining disaster which occurred at Lundhill Colliery in February 1857. The group will work with the wider community to develop an appreciation of the role mining has played in the development of the town. A community artist will consult widely through six public consultation workshops, six interviews and two workshops with primary school children to design, build and install a public art memorial which will reflect the Lundhill Pit disaster and celerate the miners who lost their lives. The memorial will be situated on the previous site of the colliery (landowner's permission obtained) which has public access. An exhibition of local mining history will be researched and collated to raise awareness of the disaster, the exhibition will include contributions from local schools and material produced through the consultation and design stages of the memorial. The Nationwide Building Society Award will be used to target and involve young people in video interviews, the video recording of the project and to design and produce an interpretative leaflet. Wombwell High School staff and pupils will develop a despoke drama production based on the event which will be staged for the anniversary of the disaster. A dedication event will be held to celebrate completion of the memorial and commemorate the 150th anniversary of the Lundhill Colliery disaster. My great, great grandfather, Edward Garbutt, was killed alongside his two sons. Hi First of all may I congratulate you on your web site. My great, great grandfather, Edward Garbutt, was killed alongside his two sons, in the Lundhill Pit disaster of 1857. I was, therefore interested to read the piece about the Wilkinson family - especially when it said that his widow returned to Wigan - that is where my great, great grandfather had come from! I have often wondered why he went down to the Barnsley area for work as there was still work in Wigan. Incidentally his widow returned to Wigan - I wonder if they were neighbours.....! Could I ask you to forward my email address to Mr Wilkinson and perhaps we can find some explanation. My grandmother's family - the Garbutts - 3 of whom died in the Lundhill pit disaster originally came from Wigan and had only lived in Wombwell a few years I have often wondered what the connection between the two places was - apart from the fact they were both coal mining areas. Anyway I notice you had another email - after mine - from Walter Sharp, who said he would like to get in touch with me. So if you could forward him my email address I would be very grateful. Cheers - glad the site is still up and running ! Nice site, dropped on it by accident yesterday and I thought I’d fill in a little more detail to this thread that has emerged doing my family tree. It was to Charles Ludrick (senior) in Wigan that she retreated (as stated in the articles) when she had the triple whammy of losing her husband, brother and brother in law on the same day. Incidentally, it appears from her children shown in the 1861 census that she may have been in the early stages of yet another pregnancy when the explosion happened in 1857. She named him Charles. I would very much like to correspond with Ron Hutchinson and Pat Gray if at all possible, especially since, if Thomas Wilkinson was his Great grandfather, then we share common ancestors in the person of Charles Ludrick (snr) and his wife Ellen. If you can let me know their e mails, or forward mine to them I would be very grateful. Incidentally, although I never went down the pit, my father was a miner from age 14 and (so far) so were the four preceding generations of Sharps so I am pleased to see sites like yours help to keep alive the memories of the mining communities. As a (to me) spooky ending to this e mail – while the family comes from Wigan my father settled in a Barnsley village previously unknown to him called Blacker Hill when he was de-mobbed in 1947. This village is no more than 2 miles from the Lundhill site and it is where I was born.